QCOSTARICA via Vozdeguanacaste.com, by Roberto Acuña Ávalos – Guanacaste is one of the largest provinces in the country with 10,140 square kilometers (3,915 square miles), but curiously it also has the least inhabitants. However, proportionally, it is the province with the third highest average birth rate for girls under the age of 18. To reach this conclusion, The Voice of Guanacaste comparednational data of women 10-17 years old with the number of births by mothers who are minor sin order to get a proportional calculation. The data used included the decade from 2004 to 2014. According to The Voice’s research, in 2014, Guanacaste had a population of 24,402 adolescent girls. That same year, the rate of adolescent pregnancies in Guanacaste was 22, which means that out of 1000 girls between the ages of 10 and 17 in Guanacaste, 22 of them gave birth. The average rate for the past decade behaves with a similar indicator, with 23 pregnant per 1,000 girls from 10 to 17 years old. The province with the highest amount of teenage pregnancies is Limon, with an average rate of 28, followed by Puntarenas with 24.6. With these results, we can see that the three provinces with the highest number of pregnancies are the coastal provinces. According to Ena Cespedes, coordinator of the adolescent mother program for the National Children’s Board (PANI- Patronato Nacional de la Infancia), these three provinces have many factors in common that make them more vulnerable. “Poverty and the low level of schooling influence strongly. Also in these provinces, we have a significan percentage of indigenous population; many of these pregnancies of girls are associated with abuse,” the coordinator explained. Regarding Guanacaste in particular, Olga Martha Araya, coordinator of the Unit of Demographic Statistics for INEC, said that economic activity is a factor that influences the pregnancy rate with that of the other coastal provinces. “What sets Guanacaste apart among the three coastal provinces is that it is the most widely developed for tourism and that means more women enter the work force. That is the reason why Puntarenas and Limon have more pregnancies,” Araya said. Another finding of the research is that teen pregnancies rates have not been decreasing considerably. For 2004, the rate was 22.4, while 2014 was 21.8, which means that it only dropped by 0.6. Although the decrease has not been significant, Cespedes pointed out that the rate has not increased either, although teenagers have sexual relations from an early age. According to Cespedes, on average, girls become sexually active between 15 and 16 years of age, while boys begin at age 14. Based on the data, the most vulnerable ages at which minors become pregnant are 15 to 17 years old. However, in 2007 and in 2010 in the province of Guanacaste, there were cases where the mother was 11 years old. Cespedes added that there is currently more access to information about the use of contraceptive methods than what was available ten years ago. On the other hand, Cartago and Heredia are the provinces with the lowest average rate of teenage pregnancies at 14.9. The Voice also analyzed rates by canton. In this case, however, it was only possible to do so with 2011 Census data. 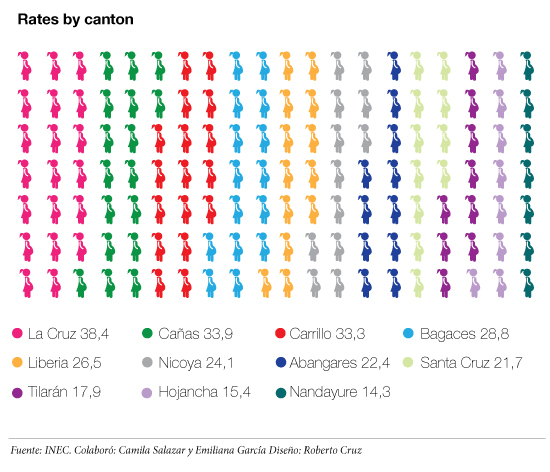 In that year, the canton of La Cruz had the highest rate, reaching 38.4, in other words, out of 1000 women in that area, 38 gave birth to a baby. To the coordinator of PANI, these results are linked to the lack of access to basic services. “It has a lot to do with little access to services in general, to education services, health and other opportunities in terms of services, since in these areas, they have fewer opportunities to dream of a life plan with better prospects. That is why it is so important that they have facilities to study,” Cespedes said. In order for the girls to be able to get ahead, PANI has a system of national scholarships for teenage mothers. In 2014, around 1500 scholarships were awarded, representing an investment of more than1 billion colones (about $1,900,000). According to experts from the World Health Organization, the most appropriate age for motherhood is between 20 and 35 years old since the risk to the health of mother and child is much lower. Pregnancy during adolescence is considered high risk. The adolescent is not ready physically or mentally to have a baby and take on the responsibility of motherhood. In many cases, adolescents who become pregnant show signs of malnutrition, a higher number of spontaneous abortions, premature births, underweight babies, children with more health problems and developmental disorders and in cases of pregnancies of girls under 15, the baby is more likely to be born deformed.